The First Presidency has announced plans to build temples in the Cochabamba, Bolivia, and Recife, Brazil, areas. Sites have been selected in both areas, and construction will commence once plans are complete and necessary governmental approvals have been obtained. The temples will be the first in Bolivia and the second in Brazil; the Sao Paulo Temple was completed in 1978. 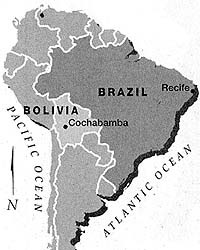 There are some 80,000 Church members in the twenty-two stakes and districts that will be served by the Cochabamba Bolivia Temple. In the Recife Brazil Temple District, there are some 102,000 Church members in twenty-three stakes and districts. There are now forty-seven operating temples spread throughout the world. With this announcement, there are eleven temples in various stages of planning and construction.